Above: But for a quirk of history, the site of last week’s wall collapse was to be tunneled beneath Charles Village. Were it not for a convoluted sentence in a century-old ordinance, the big hole that’s now bedeviling Baltimore, CSX Transportation and the residents of 26th Street would be a matter of no consequence. That’s because there would be no hole – and no retaining wall collapsing into it. The original plans of the railroad line called for a station on Charles Street. 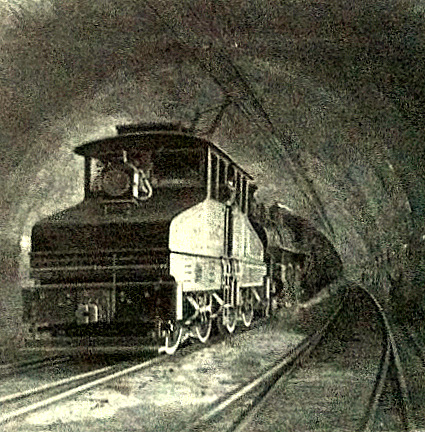 As a result, a projected rail tunnel extending from Howard Street to Calvert Street was “daylighted” at Charles Street and a large hole – 344 feet long by 100 feet wide by 30 feet deep – was constructed in anticipation of a station platform. The station was never built. By the time the B&O had completed the line in 1895, a station at Mt. Royal Avenue was underway to serve local passengers. 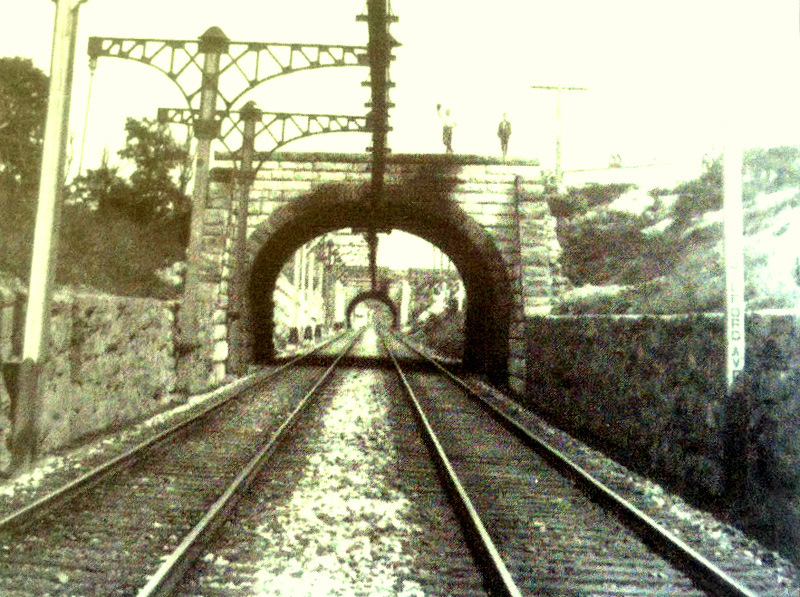 Many changes took place on the B&O line over the next 119 years. The famous “Royal Blue” passenger trains between Washington/Baltimore and New York were discontinued in 1958, the electrified double track was reduced to a single freight-only track, and the B&O itself was absorbed by a conglomerate that now calls itself CSX. What didn’t change was the deep, fenced-off hole along 26th Street, which broke up the continuity of buildings along St. Paul and Charles streets and sent plumes of diesel smoke and loud, grinding sounds from passing freight trains into the community. Currently, there are about 20 freight trains a day. In the future, CSX projects the line to be busier, in part to accommodate increased shipping to and from the Port of Baltimore, which means more noise and more pollution. Should the city simply rebuild the retaining wall and leave the decaying and overgrown ravine intact – or should residents insist that this physical barrier and environmental liability be turned into a community asset? At the very least, Margaret Brent Elementary School, across St. Paul Street from the collapsed wall, needs more playground space. Securing air rights over the CSX right of way between St. Paul and Charles could provide such facilities. A pocket park above the tunneled railroad, perhaps supplemented by a dog park, could bring people and activity into an area that gets much too quiet after nightfall. To the east, covering over the line from Calvert to Barclay streets would give the struggling Harwood community a lift. Listen to Mark Reutter discuss this story on Maryland Morning with Sheilah Kast on WYPR, 88.1FM. Consider that the only part of 26th Street that’s currently under economic revival is in the vicinity of Howard Street – where the railroad is tunneled. The planned Wal-Mart on 25th Street could be better connected to the Remington community – and valuable new space opened up for development – if the rail track was covered to Huntingdon Avenue. What’s more, filling up the line’s open cuts could permanently solve CSX’s problems with a water-saturated right-of-way and small landslides caused by the unstable slopes. There is plenty of federal transportation funding for rail infrastructure improvements, including for upgrading tunnels, bridges and terminals in urban areas. 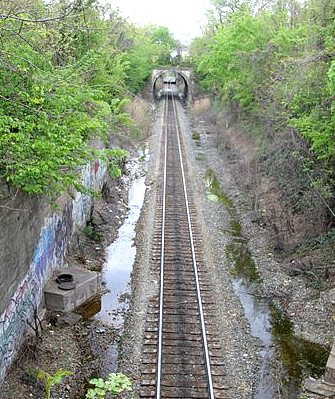 In fact, the city availed itself of federal funds to extend CSX’s Howard Street tunnel by 1,400 feet to accommodate I-395 and to improve access to Camden Yards. Tunneling CSX across the breadth of 26th street could enhance safety, sanitation and offer a real stimulus to an area that forms a vital link between Station North and the Johns Hopkins Homewood campus. There should be a public process and community-wide discussions about how to repair the rail line to better fit in with the community. City Hall needs to re-imagine 26th Street as a classy urban boulevard rather than a truncated side street with a new retaining wall. Mark Reutter was editor of Railroad History magazine between 1999 and 2007.